This year, the Powerman Zofingen is dedicated to the motto “Twelve villages – one race”. 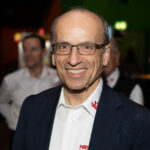 Stefan Ruf, who was confirmed as president of the association Powerman Zofingen with great applause, was able to announce at the 31st Annual General Meeting in the Hotel Zofingen that the Duathlon Long Distance World Championships will now be held for the ninth time in a row and for the twelfth time in general at the same venue. Athletes from over 35 different nations are expected at the 31st Powerman Zofingen from 6th to 8th September 2019. In the presence of about 30 OC members, who had found their way to the Hotel Zofingen for the general assembly, Stefan Ruf, president of the association Powerman Zofingen, reviewed the last event during his annual report. “In sporting terms, the anniversary event was marked by the first Swiss success since 2002, and thanks to Petra Eggenschwiler and Melanie Maurer it even became a Swiss double victory. “On 8 September 2019 there will again be ITU Powerman Long Distance Duathlon World Championships in Zofingen. The fact that the ITU (International Triathlon Union) and the IPA (International Powerman Association) are now doing this in Zofingen for the twelfth time, after 1997, 1998, 1999, 2011, 2012, 2013, 2014, 2015, 2016, 2017 and 2018 for the twelfth time in a row, and for the ninth time in a row, is unique across the globe for triathlon and especially for duathlon. “And next year the ITU Powerman Long Distance Duathlon World Championships will again be held in Thutstadt”, Ruf already looked joyfully into the future. Since an ITU Multisport Festival will be held in Holland on the traditional first weekend of September, the 32nd Powerman Zofingen will not take place until 19/20 September 2020. In 2017, the storm of the century in the Zofingen region was a challenge for the running route, Ruf said. “But the search for a new cycle track proved to be much more challenging last year.” After long negotiations, we decided in spring 2018 to leave the cantonal territory of Lucerne as far as possible and to implement a new, already planned variant through the Aargau region”. In order to meet all the requirements, secure the permits and personnel and implement feasible solutions for the numerous construction sites, a lot more money than planned had to be invested. “But it was worth it, as we were able to present a demanding and worthy course in the tradition of the Powerman Zofingen, which proved its safety and appealed to the athletes.” This year there will be, according to Ruf, only minor optimizations on the track. Ruf was positively surprised when obtaining the permits in the individual transit villages. “In the individual discussions I noted with great satisfaction that the village representatives are really pleased that the Powerman will lead Zofingen through their village. “Try to build on that now. 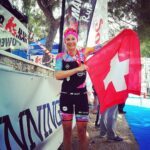 “It is important to us that this race, which leads through ten Aargau and two Lucerne municipalities, becomes a joint event and that the contacted representatives of the municipalities spread their enthusiasm among the people. You can feel that the Powerman Zofingen has a very good name. “Besides, some villages in the Mittelland can claim that there’s a world championship going through their territory and we’re even helping to make this a great thing.” It is a good opportunity for the affected villages to market their location even better, to mobilize the inhabitants for sports and to create a good atmosphere with their clubs along the bike course. The calculation for 2018 had to be closed with a minus. 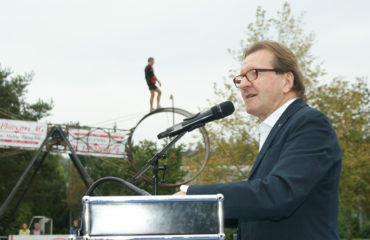 “However, we had expected this to be the case because of the new cycle route, the activities for the 30th anniversary such as the anniversary magazine or the successful world record attempt by Freddy Nock,” said Ruf, who is looking forward to positive financial results again in the coming years thanks to clean and serious work. “We want to invest now above all again into the sporty quality of our event, so that we remain the best Duathlon of the world. If we continue to succeed, then the International Federation will have the greatest interest in holding the World Championships in Zofingen”. 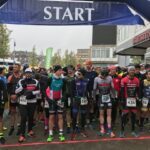 In order to regularly have 1’500 or more participants at the Powerman Zofingen in the future, the Zofingen team will work even closer together with Swiss Duathlon and the Powerman Tramelan. “We have a common interest here, namely that in the future we will be able to get even more people interested in cycling and running. In the relatively small Swiss market, it makes sense for these organisations to pool their resources in order to jointly generate even more participants”. At the same time, the Powerman Zofingen wants to invest even more in foreign athlete marketing, especially in the surrounding countries, with first priority Germany. At Powerman Zofingen, the structure of the three departments introduced in the course of 2016 will be continued. 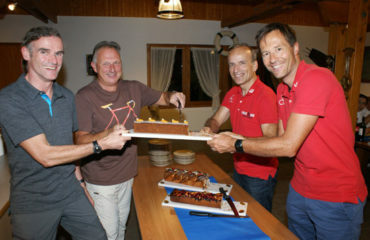 Markus Bindschädler will continue to head the competition department and Stefan Ruf will head the marketing department. The Services Department is transferred from Sonja Peter and Priska Zinniker to Oliver Imfeld, who remains General Secretary. 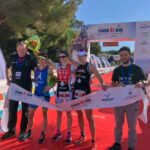 The trio, consisting of Bindschädler, Imfeld and Ruf, will then also form, together with Walter Bloch (Head of Sponsoring), the management of Powerman Zofingen. “I would like to thank the whole OC and the 700 helpers for their great voluntary work and the well over 300 companies that support us with their active sponsoring. 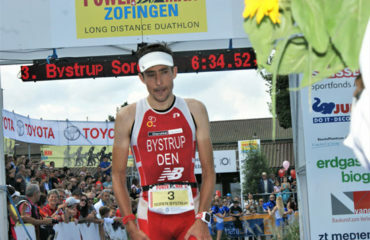 “Even more positive could be looked into the future, if the Powerman Zofingen would find a title sponsor. “The platform that would offer itself to an interested party would certainly be very promising,” said Ruf, who this year presides over the Powerman Zofingen for the 17th time as OC President. The OC of the Powerman Zofingen now has over 50 members. Ruf said it was interesting to look back at the 30-year organisational structure. “The first ten years were all about just running a race. Then you realized that this alone was no longer enough and that you had to have a supporting programme around the race. “That’s why a services team was set up to make it as pleasant as possible for the athletes and spectators at Powerman Zofingen. “And in the last ten years we have had to concentrate more on marketing the event. We must continue to expand this thanks to additional specialists in the fields of new media, marketing and communication who must be brought on board.” Anyone who is interested in volunteering can contact info@powerman.ch by e-mail. 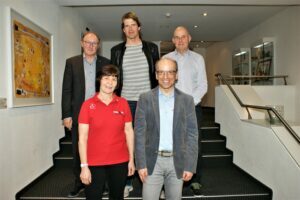 The board of the association Powerman Zofingen belongs to: Priska Zinniker, Heinz Müller, Markus Bindschädler, Walter Bloch, Oliver Imfeld and OC President Stefan Ruf. Sonja Peter and Stephan Aregger were farewells on the Management Board. The earlier you register for the 31st Powerman Zofingen from 6th to 8th September 2019, the cheaper it is. The best way to register is via the homepage www.powerman.ch .